Mildred knew that stepping into the casino would bring up memories of her late husband’s gambling debts, but at 71-years old, she needs a job. The casino is close and hiring. Instead of working as a cashier, she is chosen to work undercover. Her career as a meter maid has only prepared her for some of what she’s in store for with this new job. What a whirlwind! I never expected to read a book where the main character was over 70 and still running around getting into trouble! It was neat reading a book with a character you don’t normally see as the main character. 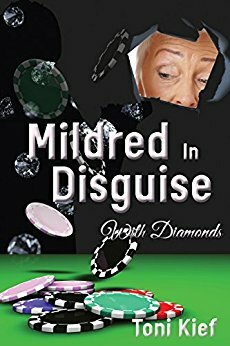 Mildred is a great blend of sarcastic, witty, humorous, and get-it-done undercover detective. Her disguises are hilarious. The story was fully fledged and the mystery was layered. Mildred got her share of bruises during her investigations, but also stepped down when the big guys were needed to catch the bad guys. I loved the insights into a large Casino and the life of an older and semi-retired lady. This novel was published through Toni Kief/Writers Cooperative of the Pacific Northwest on 03/28/2017 and is available on Amazon here. I’m really thrilled you liked Mildred. Thank you for the read and review.